Welcome, everyone, to the first week of War of the Spark previews! The design story of the set is a tale I've been dying to tell, so I'm glad it's finally here. The first part of the story is going to be about the set's focus on planeswalker cards—how it came about and what we needed to do to execute on it. 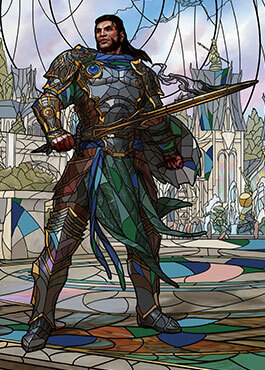 Before we're done, I'll have not one, but two planeswalker preview cards to show you. If that doesn't get you to read on, then all is lost. Our story starts many years ago, when Doug Beyer first pitched the Nicol Bolas arc (codenamed Handlebar—partly because of the stereotypical mustache twirling of villains and partly because it's the thing puppeteers use to control their puppets), a three-year storyline that would revolve around the machinations of one of Magic's oldest villains, Nicol Bolas. The story culminated in a giant Planeswalker war on the plane of Ravnica. Note this was back when each year consisted of two blocks, each with a large set and a small set. The visit to Ravnica would last for a year. The first block would consist of two large sets and be a guild block much like Return to Ravnica and Gatecrash, each with five guilds represented. The Planeswalker war would be its own block (codenamed "Milk" and "Cookies"), one large set and one small, and would be focused on the events of the war. Because the block's focus would be more on the event that was happening and less the location, when we talked about this block, we referred to it as an "event block"—something we'd never done before. As I'm a writer and a longtime fan of Magic, the idea of a war where the vast majority of the Planeswalkers came together in a giant event sounded amazing. As the lead designer who was going to have to design the thing, I was a little more concerned. How exactly do you sell a giant Planeswalker war when the block would only have five planeswalkers in it? How could a few packs communicate something that lived only as mythic rare? But the story was cool, and I didn't want to be the one standing in the way of us doing something players would love, so I voiced my concern and said we'd figure out a way to solve the problem when we got to design. A lot changed though between that initial meeting and the start of War of the Spark design. Magic had shifted away from blocks, and instead of the war being a large and small set, it turned into just one large set. Now we had access to even fewer planeswalkers. How in the world were we going to pull this off? The first thing I did when War of the Spark vision design started was go and talk to Play Design about how many planeswalkers a set could support. Standard traditionally has up to 20 planeswalkers in it, which means we get about ten a year. If a few were more niche focused (they worked well, but only in a very specific deck), maybe we could sneak a handful of extra ones in. We could also maybe skim the sets around us so they would each have one less, allowing WAR to have a few extra. That could allow WAR to have maybe seven or eight planeswalkers instead of three. Okay, that was enough to get in Bolas and the Gatewatch. I guess that was the best we were going to do. I then turned my team's focus on finding ways to execute on a war. This was going to be an event set, so I wanted to find a way to mechanically make the war an integral part of the set. It wasn't just going to be a Planeswalker war but a Planeswalker WAR! This led us to creating the skirmish mechanic, a very out-of-the-box mechanic focused on making the game feel like a war was going on (I'm going to talk about the mechanic, which didn't end up in the set, in part 3). We spent months making skirmish work and trying to ramp up the feeling of an ongoing war, but something just didn't feel right. So, I tried an exercise I like to do when I feel a little lost, which I call an "elevator pitch." In Hollywood, one of the jobs of a writer is to convince other people to buy your story idea. To do this, you have to pitch it to them (aka tell them a condensed version of the story that excites them). Normally, when I would prepare a pitch, I created three versions of the pitch. One was the long pitch. This was usually 3 to 5 minutes where I spelled out the story in a bit of detail. It usually included snippets of dialogue and did a lot to capture the overall feel of the piece. The second was the short pitch. This was usually 1 minute long. It had less detail, but still tried to capture the essence of the piece just in a shorter pitch time. Third was the elevator pitch. This was the pitch in one sentence, no more than ten words, something that captured the essence of what made the story great. The idea being something you could yell at a producer as the elevator doors closed. Something that would make them hit the "open door" button and say, "Tell me more." Over the years, I found the elevator pitch to be a very useful tool as it forced me to figure out what was the essential cool thing about my story. What was the core of what made it an exciting idea? Condensing your story to one sentence forced you to figure out what really mattered. So, when I'm stuck on a set, sometimes I like to figure out my elevator pitch for the set. What would I yell out to make a Magic player hit the "open door" button and say, "Tell me more"? Imagine every Planeswalker you know, all together on Ravnica—fighting! Now, I went back and analyzed my sentence. What made it tick? I'd mentioned the war at the end, using it as what we call a "stinger" (aka ending with a word that adds extra oomph), but interestingly, I used five words capturing the idea that all these Planeswalkers would be in the story and four words telling you they'd be together on one of Magic's most popular planes. In other words, we'd been building Planeswalker war when what made the set exciting was Planeswalker war. I'd been putting our focus in the wrong place. How do you make a Planeswalker war set? You need a lot of planeswalker cards. We spent a lot of time trying to come up with answers other than that, but every other solution rang false. If I told someone we'd made a Planeswalker set, the first question they'd ask would be "How many planeswalkers are in it?" If you answered three, or even five, or maybe even seven, they'd say, "That's not a Planeswalker set." No, to be a Planeswalker set, we would need to put a lot of planeswalkers in it. Enough that when people heard how many are in it, they wouldn't initially believe it. It had to be a number large enough that the first response would be, "What?!" I've talked many times in this column about how planeswalkers are the most popular card type yet have the smallest design space. 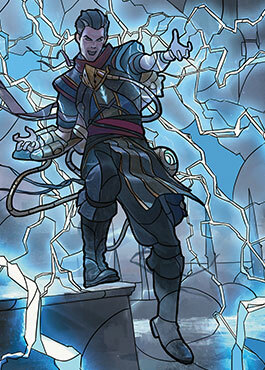 As such, I've spent a lot of energy slowing down how often we innovated on planeswalker design. If we were going to blow out the card type in the set, we'd have to deal with what it meant for the resource issue. War of the Spark only had fifteen mythic rare slots. 30 planeswalker cards literally couldn't fit. On top of that, we want the set to deliver the Planeswalker war not just in Constructed but also in Limited. (This is why a Time Spiral block–style bonus sheet wouldn't have worked.) To make the as-fan work for Limited, we'd need to have uncommon planeswalkers. (We'd also help this by using Dominaria collating technology to make sure every booster pack included a planeswalker card.) While it's possible we could shift planeswalkers as we'd always done them to rare, they were just too complex for uncommon. This would require some design innovation about how we create planeswalker cards. In order to diversify our planeswalkers, we tend to spread them out in color, usually two-colored. 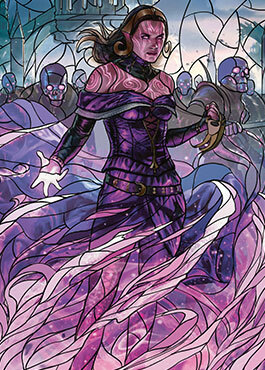 Having a high volume of two-color planeswalkers, especially at uncommon, would have huge Limited design issues. For instance, we want players to be able to put a bunch of planeswalkers in their decks (as that's the thing the set is doing). If the majority of the planeswalkers are stretching over two colors, it would be very hard to have a bunch in your deck without having to play a lot of colors. We'd have to solve this problem. There's a reason we only make ten planeswalker cards a year. Upping the number in the set would cause havoc with balancing them in Standard. While Vision Design isn't responsible for any of this balancing, it is our job to make sure the set has the tools to allow Play Design to do it. What would those tools be? That's a lot of issues to tackle. Let's get to it. Back in Hour of Devastation, we had to design a Nicol Bolas planeswalker card. This was the end of Act I of the Nicol Bolas arc where Nicol Bolas shows up and easily defeats the Gatewatch. This was us reintroducing the character and establishing what a major villain he was. That meant we wanted a cool planeswalker card. A bunch got designed, but one of the most popular was one that had a static ability. Now, I'd been holding back from planeswalkers having static abilities because I knew once we let that cat out of the bag, it would be hard to put back in. Planeswalker innovations had to be doled out slowly, and this was a big one. (And yes, there are a few narrow examples of old planeswalker cards having static abilities—in this context, I'm talking about enchantment-like static abilities.) I made a compromise. Let's just make a four-loyalty ability Bolas in Hour of Devastation (we hadn't made one yet) and then when we made the next one in War of the Spark (we knew our major villain had to have a planeswalker card in the climatic set), we'd let that one be the starting point of static abilities on planeswalkers. 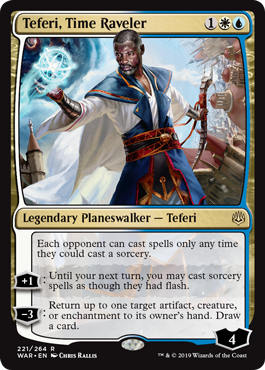 If this was going to be a planeswalker-themed set, maybe we could introduce static and triggered abilities in a grander fashion. Rather than Nicol Bolas being the introduction of static/triggered abilities, what if many of the planeswalkers had static/triggered abilities? What if this was a mechanic feature of the set? 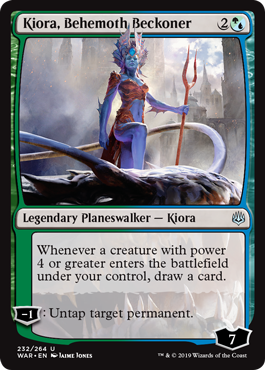 This would definitely open up a bunch of space to play around with and allow us a greater wealth of planeswalker designs. Then there was the problem of just eating up planeswalker design space overall. A little of it would be okay as it's not every set we would do something like this. The bigger solution would tie into our next problem. 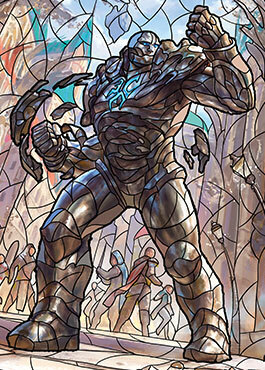 If uncommon planeswalkers, which would make up the majority of planeswalker design in the set, looked a little different than normal planeswalkers, then that would broaden the planeswalker design space. This problem mostly boiled down to "How can we make uncommon planeswalkers?" Luckily, the solution to this problem had been broached while we were trying to solve a different planeswalker problem—Planeswalker Decks. We wanted to revamp our intro decks and infuse them with planeswalkers. The idea was that each deck would introduce you to one of our Planeswalkers, so that your first connection with the game would allow you to learn about the core creative conceit of Magic. This meant that we had to put a planeswalker card in each deck. The question asked of the designers was, assuming we could design a planeswalker just for the deck, how should it be designed? There were a lot of different takes, but mine took a very minimalist approach. What if we limited the planeswalkers to just one loyalty ability? Or maybe no loyalty abilities and just one static ability? Yes, it would look a little different, but it would have a loyalty and the opponent could get rid of it by attacking it. I felt it would be a way to have a planeswalker feel without being quite as complicated as our normal planeswalkers. Obviously, my suggestion didn't win out with the Planeswalker Deck planeswalkers, but it did start me down this path of a planeswalker with fewer loyalty abilities. For our first uncommon planeswalkers, we limited them to just one ability. Some had a plus ability, meaning they got harder to kill each time they used their ability. Others got a minus ability, meaning that, barring outside help, you could only use their abilities a certain number of times. The final group got a static or triggered ability. For them, the loyalty was just a track of how much damage it took for your opponent to get rid of them. The single plus abilities didn't play all that well. It required you to keep track of the loyalty, but it often didn't matter. Unless the opponent was attacking the planeswalker, the counter tracking was irrelevant, and once you had enough counters that attacking it was fruitless, players stopped even tracking the counters. The static/triggered ability planeswalkers fell kind of in the middle. They didn't require much irrelevant tracking. Either your opponent was attacking the planeswalker and its loyalty mattered, or they weren't and there was nothing to track. The biggest problem with them was they didn't feel as planeswalker-y as the other versions. The lack of a loyalty ability made them feel like they had less agency. They played well though, essentially enchantments with a vulnerability to creatures. After the playtest, we got rid of the single-plus-ability planeswalkers and played with the negative-loyalty planeswalkers and the static/triggered-ability ones. For rares, we tried them with having a static or triggered ability and two loyalty abilities, usually one positive and one negative. Mythic rares had a static or triggered ability and three abilities. This was the general approach we took when we handed off the file. Set Design got enough feedback that the single-ability planeswalkers felt a little underwhelming for planeswalkers, so they made the choice to have each of them have one static/triggered ability and one negative-loyalty ability. In our early playtests, we just had each uncommon planeswalker be the colors players associated with them, meaning many were two-color. It became very hard to play a larger number of them. We tried adding some color fixing, but it just made players try to dip into three-plus colors. While we were on Ravnica and wanted a certain amount of multicolor in the set, we didn't feel the point of this set was to push players into so many colors. Next, we tried turning all the uncommon planeswalkers into monocolor cards. It worked okay for some planeswalkers that leaned toward one color, but the ones that seemed evenly split felt a little off. The solution ended up being hybrid mana. It allowed us to make multicolored planeswalkers that didn't require both colors being in the deck. Hybrid planeswalkers had been something players have been asking about for a long time. The simpler uncommon designs made it easier to create hybrid planeswalker designs (the biggest restriction to former hybrid planeswalkers). This problem was mostly passed along to Set Design and Play Design, but we did do a few things to provide some tools. Uncommon planeswalkers acted a bit differently than normal planeswalkers, which allowed the other teams to treat them a little differently than normal planeswalker cards for balance purposes. The volume of them allowed the teams to direct some of them at Limited and not have to make all of them Constructed shots. Finally, the nature of designing so many different planeswalkers and keeping them off one another allowed the designs to be more niche and focused, making them easier for Play Design to balance. Before I move on to addressing a few other issues we had to care about, I thought I'd show off my first preview card today, one of the uncommon hybrid planeswalkers. The next big issue we had to address was the as-fan issue. Yes, 36 planeswalkers was a lot, but in the overall makeup of the set, it's a small percentage of the cards. The Planeswalkers' influence had to extend beyond the planeswalker cards themselves. 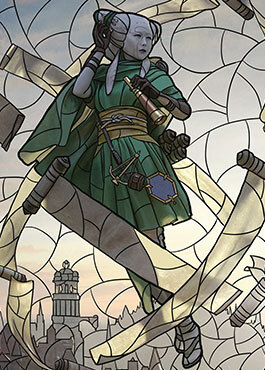 We knew because it was an event set that there would be a lot of art showing off story moments and many of the Planeswalkers would show up in the art. We also knew we were going to borrow from Dominaria and have each booster pack contain a card from the theme of the set, in this case planeswalkers. That, though, still wasn't enough. The idea we came up to solve this problem was what we called "signature spells" in design. Each planeswalker in the set would get a spell that represented the kind of magic they would cast. Many of these spells would just be the basic kinds of spells every set needs to have. Then their name was used in the title (usually "[Planeswalker]'s [Name of Spell]"), and they were pictured casting the spell in the art. We then skewed these spells to be mostly common and uncommon. This would help reinforce who all was fighting in the Planeswalker war, help up the as-fan of our theme, and get our theme down to common. With that out of the way, we had one last issue to tackle. Which Planeswalkers would be in this set? We ended up with 20 uncommons, two of each monocolor and one of each hybrid combination. Three mythic rares representing the major protagonists and antagonist in the story, and a whole bunch of rares (it ended up being thirteen) in both monocolor and multicolor. The plan in vision design was to give our best guess at who was there, including what we thought would be the ones players would most want to see. We left out Planeswalkers that were dead, ones that we were using elsewhere, and ones that seemed super unlikely to show up. Once we did this, what we discovered was that it was a very color-imbalanced list. We had a lot of different red planeswalkers, for example, (especially blue-red) but not nearly as many white or blue ones. This is why some Planeswalkers weren't able to make it into the set while other slots have brand-new characters in them. The final decision for who was included was made by Set Design working with the Creative team. 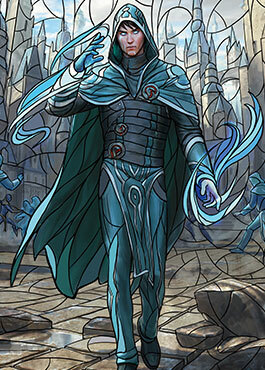 Before I go, it's time to show off my other planeswalker preview card—a member of the Gatewatch, no less. That's all the time I have for today. I hope today's column has given you a little better insight into what we had to do to include so many planeswalkers in the set. As always, I'm eager for your feedback on this column, on what we did with the planeswalkers in this set, and thoughts on War of the Spark in general. You can email me or contact me through any of my social media accounts (Twitter, Tumblr, Google+, and Instagram). Join me next week for part two as I talk about the Little Mechanic That Could. Until then, may you enjoy playing with your favorite Planeswalker.